Edward Albert Christian George Andrew Patrick David, 1894–1972. King Edward VIII, 1936; Duke of Windsor, 1936–1972. Autograph sentiment signed, Edward, one page, 4¾" x 7", on the Dukeʼs engraved stationery, [no place], April 1951. This piece has an outstanding date association. 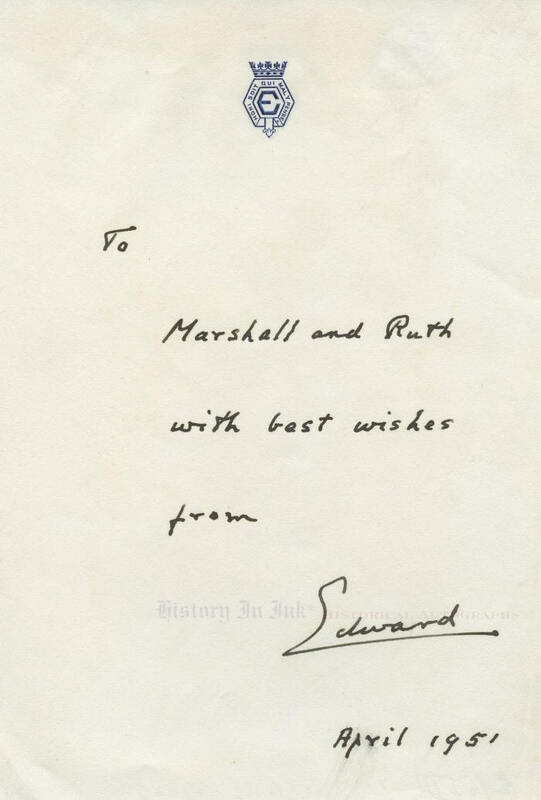 The Duke inscribes and signs this beautiful, bold sentiment “To / Marshall and Ruth / with best wishes / from / Edward / April 1951." The April 1951 date is important because Edwardʼs memoir, A Kingʼs Story: The Memoirs of the Duke of Windsor, was published that month, on April 19. A Kingʼs Story reignited the controversy that surrounded Edwardʼs 1936 abdication. Although Edwardʼs brother and successor, King George VI, and the royal family would have preferred to keep the controversy buried, Edward thought it important to express his own view of the abdication crisis. At the time, in a farewell speech broadcast on radio after his abdication, he told the British people that he had “found it impossible to carry the heavy burden of responsibility and to discharge my duties as King as I would wish to do without the help and support of the woman I love,” the American divorcee Wallis Warfield Simpson. He insisted that the decision to abdicate was “mine and mine alone" and that Wallis had "tried up to the last to persuade me to take a different course." Still Wallis was vilified in many quarters, and she was ostracized by the royal family—George VI ordered the family not to attend the wedding, threatened to cut off Edwardʼs financial support if he returned to England uninvited, and denied Wallis the right to bear Edwardʼs title of "Royal Highness." Edward wrote in A Kingʼs Story that as “the years have gone by, error and supposition have persisted, and it has become more and more plain to me that it is my duty to tell the facts as I know them before time and unchallenged repetition have given their sanction to misconceptions.” The Windsors, who had traveled to the United States for the Duchessʼs surgery in February, remained in New York to celebrate publication of the book in April. The eldest son of King George V and Queen Mary, Edward had been wildly popular across the British empire as Prince of Wales. He acceded to the throne upon his fatherʼs death on January 20, 1936. Soon he made clear his intention to marry Wallis, who was then seeking a divorce from her second husband. Wallis, however, was unacceptable to the British government and in particular to Prime Minister Stanley Baldwin, whose government rejected the King's proposal for a morganatic marriage. Faced with choosing between Wallis and the throne, Edward abdicated on December 11, 1936, and he and Wallis were married at Chateau de Candé in France on June 3, 1937. Edward has boldly penned and signed this piece in black fountain pen on his personal Craneʼs stationery, which bears his engraved cipher in blue at the top. There is slight brushing to the date, and there are mounting remnants at the top of the back and minor handling dings that are not particularly noticeable. A small diagonal creases in the blank lower right corner could be matted out were the piece framed. Overall the piece is in fine condition. Unframed. Please click here for information on custom framing this piece. Click here to see other royalty and World History items.